I love the chemistry of baking. I remember baking as a kid and being fascinated by being able to mix simple ingredients together and make something totally different from any of the inputs. My Mom thought she was being sneaky by using it to teach me fractions, but I think she really gave me an interest in chemistry instead. I love watching eggs and sugar transform before my eyes into foamy goodness. It’s one of the best parts of making a génoise. Other than the eating of it, of course. Once you’ve beaten the eggs & sugar into a foam, you mix a little of the foam in with the browned butter and vanilla, then fold the flour into the foam. I had to use the cake flour + cornstarch substitution because it turns out I’m out of Robin Hood “best for blending,” which is the equivalent of Wondra flour that is specified in Rose’s génoise recipes. 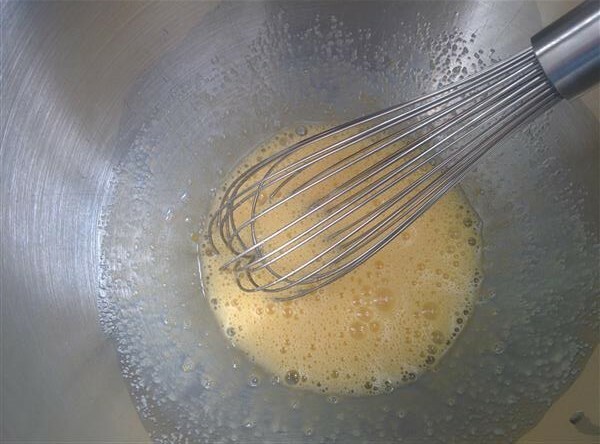 I use my stand mixer’s whisk attachment to fold flour into eggy foams, because it’s the ballooniest whisk I have. Then you fold in the foam that was mixed with the butter & vanilla. Pour into the shortcake pan. Don’t be like me – be careful when pouring it in, to make sure it gets nicely into the very bottom corners of the pan, so that you end up with perfectly shaped cakes. There was a thread in our Facebook group about the price and availability of Meyer lemons. I found them at Sobeys for $4.99 for a 1 lb bag. Given that normal lemons were pretty close to the same price at, typically, about $0.99 per lemon, I didn’t think this was particularly usurious, but my baking friend from Florida said “No way” to $2.99/lb. Oh what a difference perspective makes to food prices! 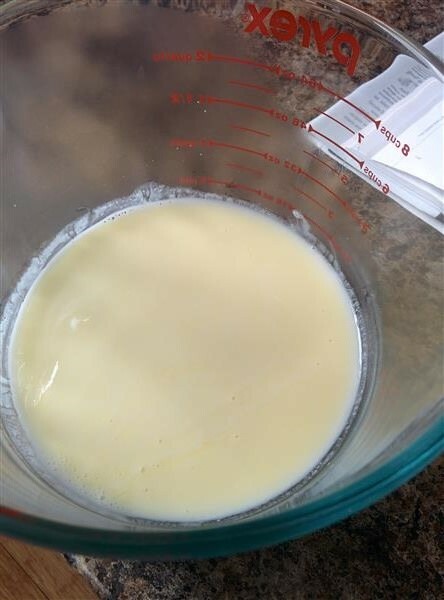 To make posset, which is apparently a treat that goes back to medieval times, you scald cream, then, basically, curdle it with something acidic. In this case, you also add sugar. It’s not really curdled, but it’s definitely clotted. After it’s set up in the fridge a bit, you take the top layer of posset, which is thicker than the stuff underneath, and spread it in the crater on the cakes (which have previously been dowsed in lemon syrup and brushed with apple jelly to make sure they stay moist). First layer down – you can see my lopsided cakes here. After taking off the top layer, you can see that my posset is still somewhat thick. Nevertheless, the cakes go into the fridge to set the first layer up. Then you take them out, and spoon out enough posset to fill up the cavity in your shortcakes. All done! Let’s see what Gilad thinks of them. The somewhat liquidy leftover posset from the bottom of the bowl was tasty! Posted on February 22, 2015 by KristinaPosted in The Baking BibleTagged génoise, lemon, posset, shortcake. Looks great!! You gave them all to Gilad? Did you try even one? I didn’t have any leftover posset. The genoise smelled like Madeleine cookies baking to me so leftover Posset with a Madeleine would be easy peasy! Although I’m buying Madeleines, not making them. I like your pan. Is it a Nordic Ware? 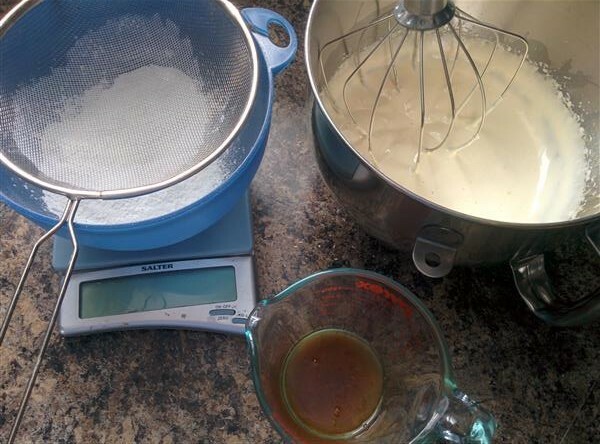 I use the mixer whisk, too. I can’t find a really big balloon whisk and I’ve tried. Glad you found the lemons for that good price.. over here in Tampa they were 2.69 EACH! but I made them with the regular lemon and they were just as delish. I’m sure Gilad will love them. I forgot them at home in the fridge this morning. 😦 hopefully still good tomorrow! Really good! I got half of one. He cut them into quarters and shared with his team, with one whole one to take home for later. I think the texture of the cake probably suffered from the extra day in the fridge, but I definitely enjoyed the flavours! They look perfect. If you gave them all away, you need to make more for yourself! Hi Kristina: You are unbelievably generous! Great job on your beautiful shortcakes. I love them but they were fussy to make. Not the baking–it was all the syrup–WAIT–glaze–WAIT–make the possett–WAIT–fill the cakelettes–WAIT….I guess you can tell that I am an impatient kind of person??? I feel very fortunate to have found my meyer lemons very inexpensively. Really loved the posset – made it again a few days later. So delicious.